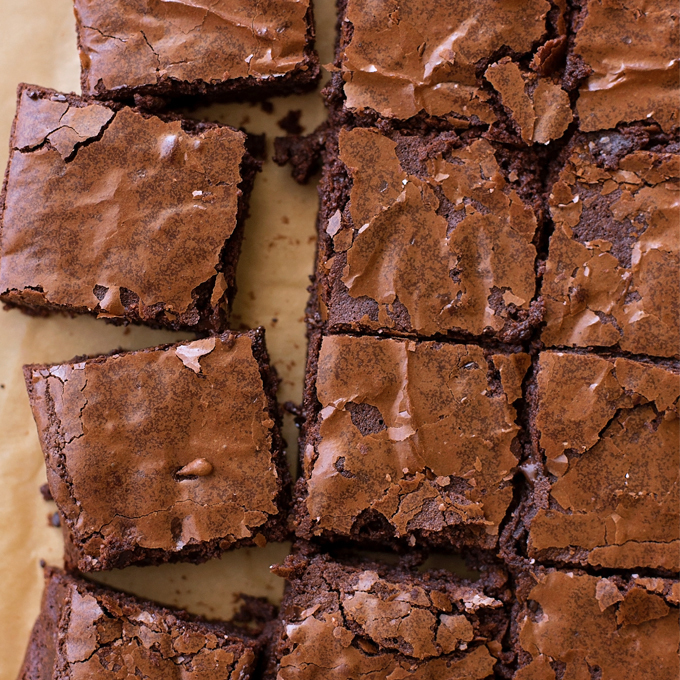 Thick, rich, chewy brownies made from scratch and ready in just 45 minutes. These irresistible bars may be dairy-free but they taste just as good as their buttery counterpart. Back in March I said goodbye to ALL things dairy and soy. It was rough, especially at first. I was hungry and moody but wanted so badly to help our little baby get better. Thankfully he has. It was not an easy journey and to be honest I’m not sure it’s entirely over. We’re in a re-introduction phase and we’re taking things extra slow. Keeping my fingers crossed that butter, yogurt and milk are on the horizon for the both of us. About 2 months into the elimination “diet” I was craving chocolate… hard. Most chocolate either contains milk or soy whether it’s intentional or just trace amounts from shared equipment. I found this out the hard way. Baby was upset and I was regretting my decision to indulge even if it was just tiny piece. That’s where these brownies came in. They’re made with oil (coconut or canola) and have cocoa powder instead of melted chocolate. I added some chopped Enjoy Life chunks to them so that they would taste more like what we’re used to eating, and guess what? They were delicious! Chewy, fudgy, with a thin flakey layer of meringue on top. Craving satisfied. 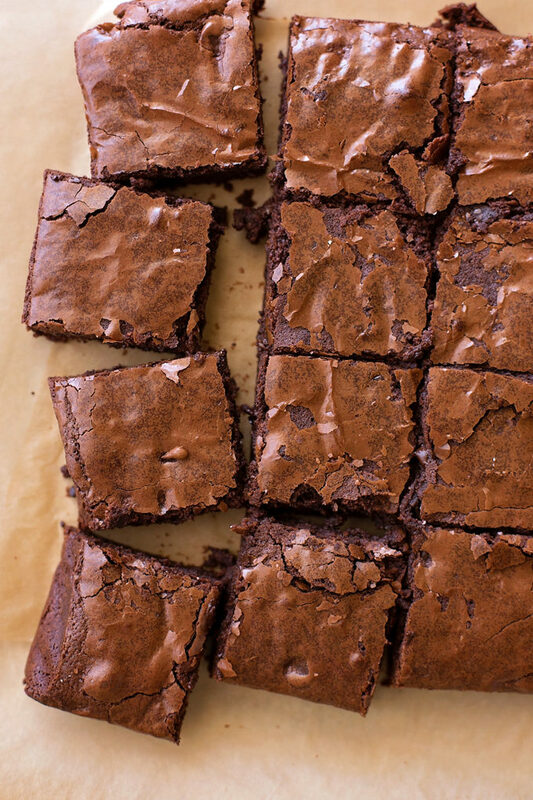 To bake the brownies you’ll need an 8×8-inch metal baking pan. DO NOT USE GLASS. If there’s one thing I’ve learned over the years, it’s that brownies should always be baked in a metal pan. Trust me. Because I had to keep these dairy-free, I lined my baking pan with parchment paper. I found that they stuck (just a little bit) to aluminum foil. It was annoying enough for me to make them again just see if parchment would solve the problem. It did! To make the brownies you’ll start by adding the oil, sugars and vanilla to a bowl of a stand mixer or a large mixing bowl. Using the stand mixer or a hand mixer, mix on medium speed until combined, about 1 minute. Add two eggs and one yolk, mix on medium speed until combined, about 30 seconds. Let the batter rest for 3 minutes, then beat for 30 seconds. Repeat two more times. This process helps give the brownies that coveted shiny meringue crust. In a separate mixing bowl combine the dry ingredients: flour, baking powder, salt, and cocoa powder. 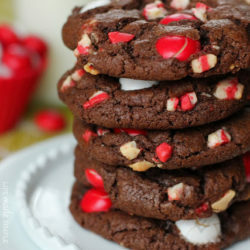 I’ve made this recipe several times now and I have used Scharffenberger, Guittard Cocoa Rouge, and Ghirardelli powders. You can’t go wrong. 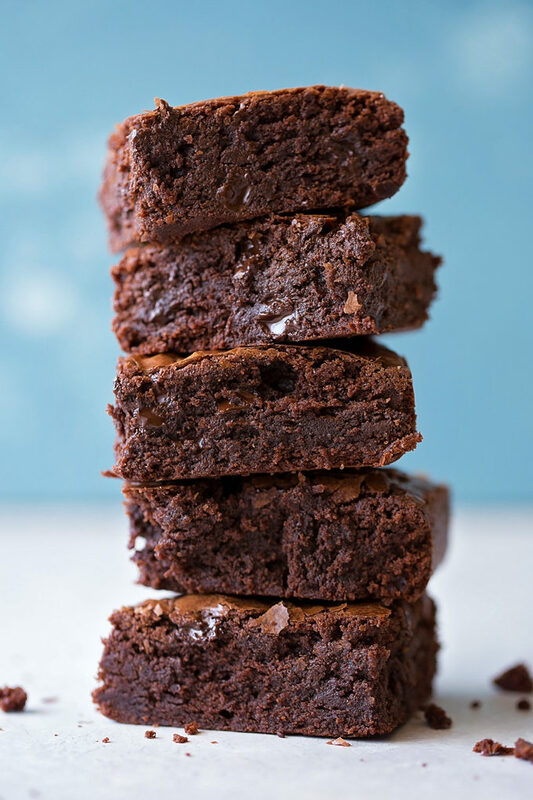 I also like adding a 1/4 teaspoon of espresso powder which helps add depth to the flavor of the brownies. It’s not enough to taste it or to get you wired, I promise. Give everything a good whisk, then with the mixer on low, slowly add the dry ingredients and chopped chocolate, then mix for 30 seconds after you see the last streak of white. 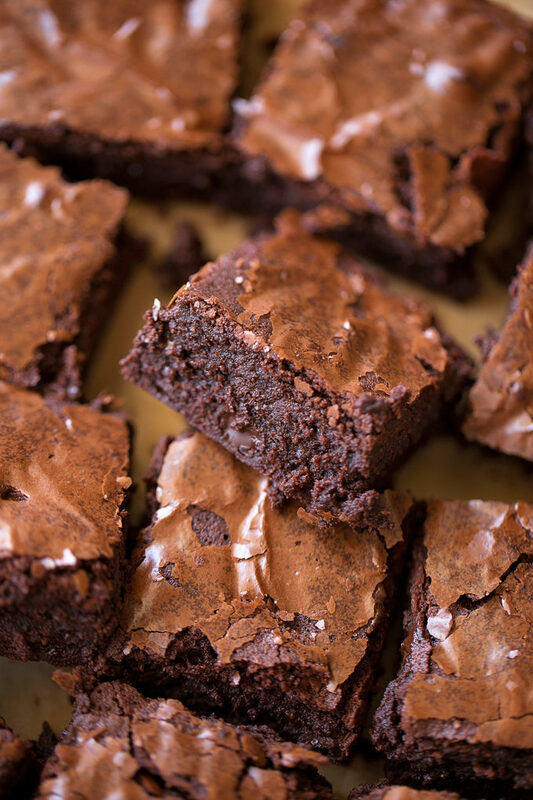 Bake the brownies for 25-35 minutes. Keep an eye on them and use a cake tester or toothpick to check for doneness around the 25 minute mark. Every oven is different, every pan is different and every altitude/climate is different. Baking times are specific to you and your kitchen. When they are set in the middle, remove them and let them cool for at least 30 minutes before cutting and serving them. They will still be warm and gooey but they won’t fall apart when you cut them. 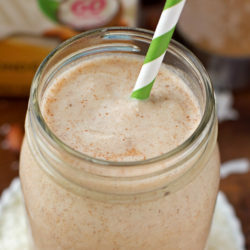 Enjoy with a big glass of milk, or in my case, almond milk! Preheat oven to 350 degrees. Line a 8x8-inch metal baking pan with parchment paper, set aside. In the bowl of a stand mixer fitted with the paddle attachment or a large mixing bowl (using a hand held mixer), add the oil, sugars and vanilla. Mix on medium speed until combined, about 1 minute. Add the eggs and yolk one at a time, mixing after each addition, then mix for 30 seconds. Let the mixture rest for 3 minutes, the repeat by mixing for 30 seconds. Repeat two more times. In a medium mixing bowl whisk together the cocoa powder, flour, salt, baking powder, and espresso powder (optional). Slowly add the dry ingredients along with the chopped chocolate and continue mixing for 30 seconds after the last white streak disappears. Pour the batter into the prepared pan and place in the oven to bake for 25-35 minutes or until a toothpick inserted into the center comes out with a few moist crumbs. Remove from the oven and allow to cool in the pan for 30 minutes before slicing and serving. * I used Enjoy Life Mega Chunks and chopped them a little, you can also use a bar of your favorite dairy-free chocolate. Just a question for you. What glass not not alumni? 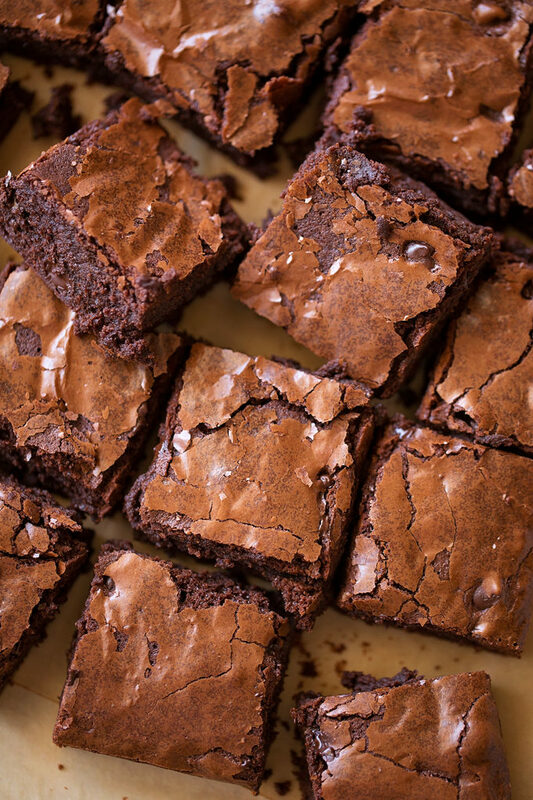 I’ve always used glass and have not problem with my Brownies? They are always delicious…. 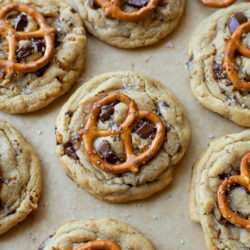 I would like to try this recipe, but was wondering if I can reduce the sugar (white and brown) and by how much as it seems there is too much sugar (1 1/4 cups sugar for 1/2 cup flour)? 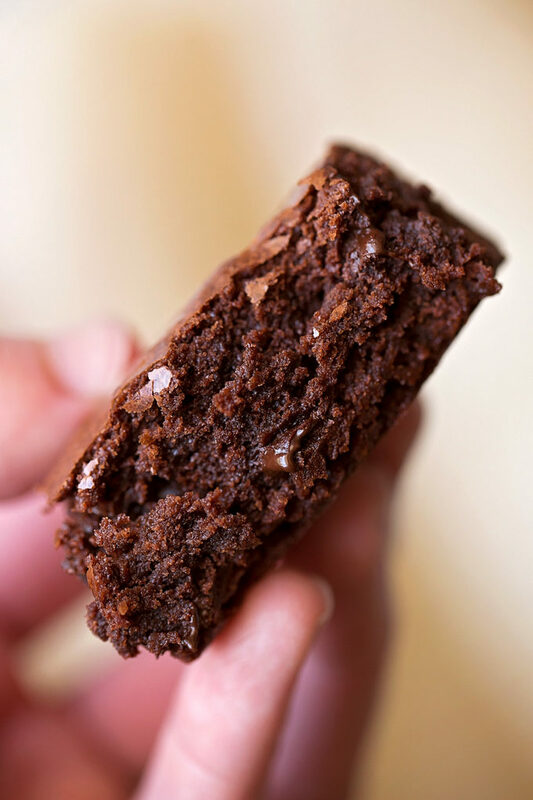 Hi, these are definitely the best homemade brownies I have ever made…. I used dark brown sugar, and olive oil as that was what i had on hand, and along with the dairy free chocolate chunks, I added some dark chocolate (dairy free) chips as well. They are so gooey and delicious, just the way we like them. Thank you for posting your recipe!! I made these yesterday and I love them!! I subbed the sugars for 1 cup of coconut sugar and I swirled some peanut butter through the top. They came out so delicious! !